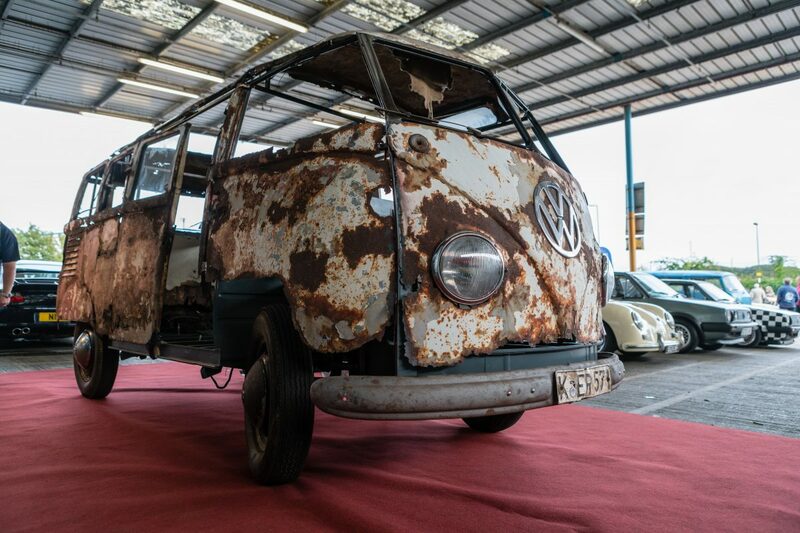 today 67 years ago, the Samba was finished in the Wolfsburg factory and the next day it was send to the big VW-dealership Fleischhauer in Cologne. Still today anything else of its history between August 28th 1951 and May 2017 is remaining unknown. None of my attempts to identify a former owner was successful. I published the license number K-ER 571 in all big local newspapers and the local TV, I even created a picture of the Samba by photoshop showing the Samba in the state it must have driven around Cologne: sealing wax red in the bottom, chestnut brown in the middle and the white roof on top, but nobody can remember the Samba so far! But I don´t give up. I am sure someday I will discover a piece of its history somehow. My little photoshop homework: this is the way the Samba must have looked in its early days. So strange nobody recalls this bus. Remember, 80% of Cologne was bombed to the ground, the entire city was still in kind of agony 1951. 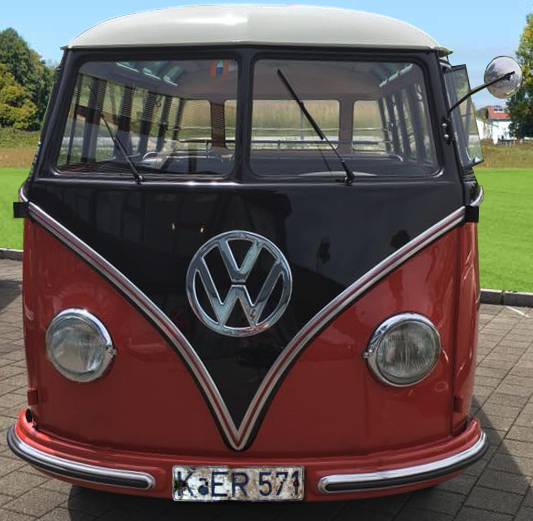 A three color luxury VW-bus must have been something “unreal” back in those days. There must be pictures, there must be somebody still alive who was impressed by this vehicle. I will find him. Strange, but true: I found out an interesting detail about the time before the Samba left Wolfsburg! By total accident the birth certificate of another bus crossed my way and this bus was due to the certificate built on August 15th 1951 (so more than a week earlier than the Samba), but has a much later chassis number than the Samba! What does it mean? 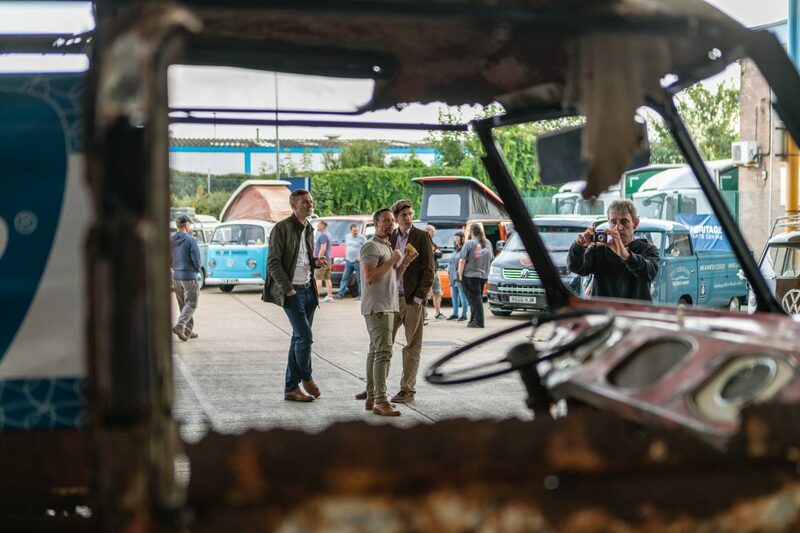 The most likely explanation is that in the factory they grabbed for the Samba production in the very early days a bare, chassis number stamped, body from the assembly line and moved that into a special department where they converted the body into a Samba more or less by hand. When you have a close look on the “deep sky light” section of the roof, it´s easy to see this is not made by a professional big quantity assembly line, it´s kind of custom made. Same difference when you inspect the dashboard of the very, very early Sambas. Even the hole for the ashtray is obviously cut out by hand! Obviously this whole conversion process in the factory was impossible to do in one day! 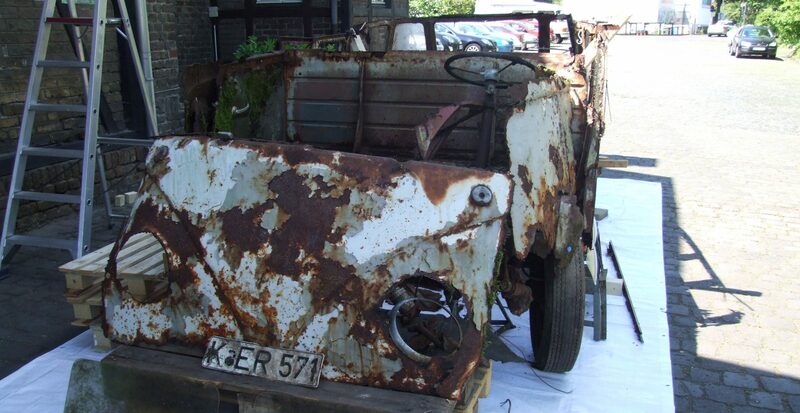 That´s why a bus showing a later chassis number was officially “born” earlier than the Samba. While the Samba was in its few days lasting handmade conversion process its regular brother was assembled in just one day and overtook the Samba this way easily. 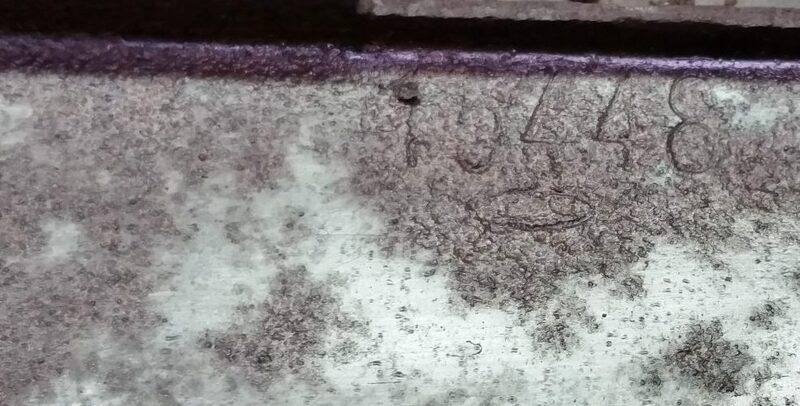 Another fact proofs that theory: same as some coach builders (for example many Italian sports cars) the factory stamped many Samba-specific parts of the very early cars with the chassis number or at least with the last three digits. So they did on the dash (see previous post “An amazing find”) and they did elsewhere. See here what I found. The whole chassis number 15448! Amazing, isn´t it? I won´t tell where I found the number exactly to avoid helping the deceivers faking regular busses into Sambas, but to all of these bad guys and the ones willing to spend big money for such a car: the very small community of honest and passionate VW-experts will always be able to identify a faked Samba, so anybody in the mood to buy an early Samba, better reach out for the expertise of a pro before buying! But why stamping components with the chassis number at all? It´s easy to explain, it just helps to avoid messing up the parts of several cars standing side by side during the conversion process. Just imagine, this must have looked more or less the same way as in our garages today. Remember, they built less than 270 Sambas in 1951, starting most likely in March or April (*see special note at the end of the post), what means they finished not even two per day! This must have been kind of handmade prototyping; there was no assembly line for Sambas in 1951. Now, a little 67 years later, the Samba is in need for some handmade process again. 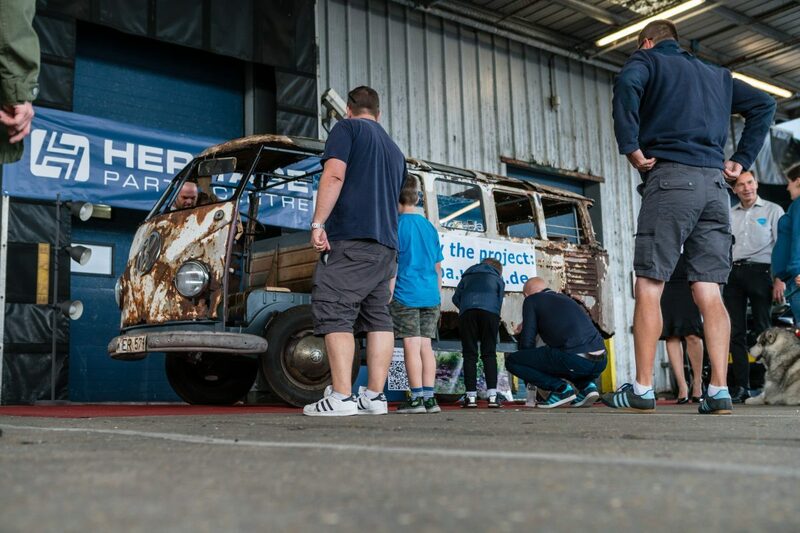 So I after our great Amersfoort adventure and all the photo shootings for a lot of press articles it was time for me to bring the Samba back to Mark Spicer, so the body work will be continued. 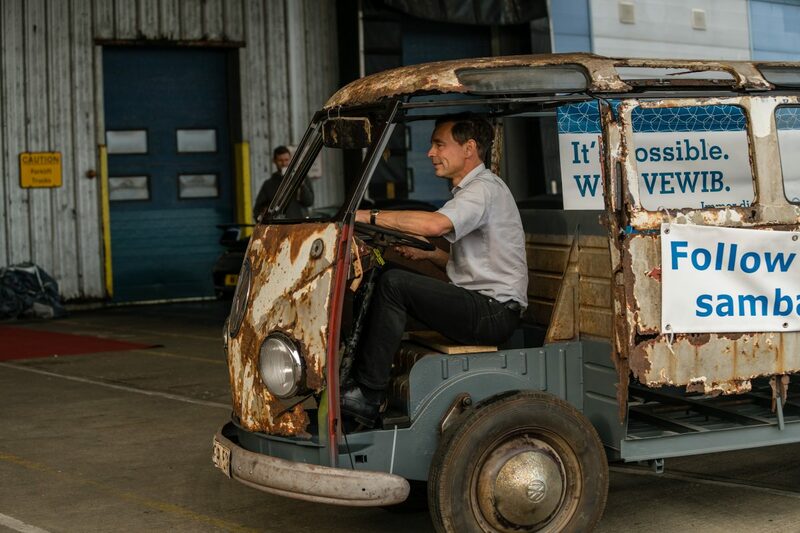 Believe it or not, this baby drives! Parking it in the right place before the crowd shows up….. It might look like Frankenstein, but you can come a little closer, it won´t bite. 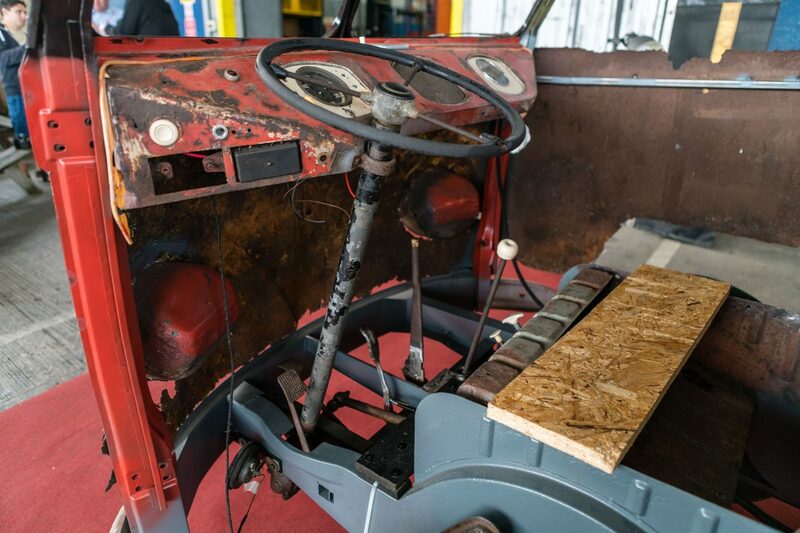 The steering wheel is not correct for a Samba, it is an early Standard Beetle wheel, but it´s the one that was with the Samba when we found it last year. But why should anybody change the beautiful, big, ivory samba steering wheel and replace it by a basic, small, black Standard wheel? I can imagine of one explanantion only: One of the prevoius owners must have been extremely fat! Can you think about a better reason? Let me know! 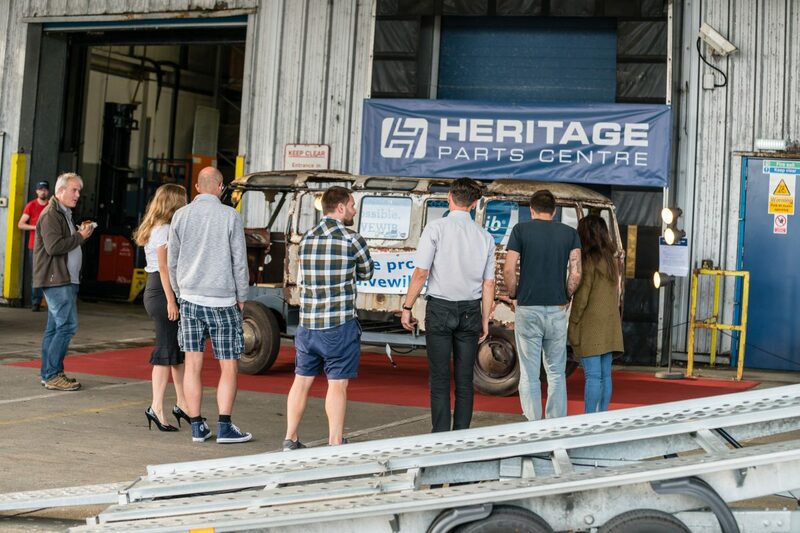 Barney, CEO of Heritage Parts Centre, enjoys a hot dog while watching the crowd photgraphing the Samba on and on and on. Just 13 months ago this was poor pile of rotten metal in the woods, today the star on the red carpet. What does this teach us about life? Next morning I continued my way to Mark and believe me I was so happy to arrive safely! 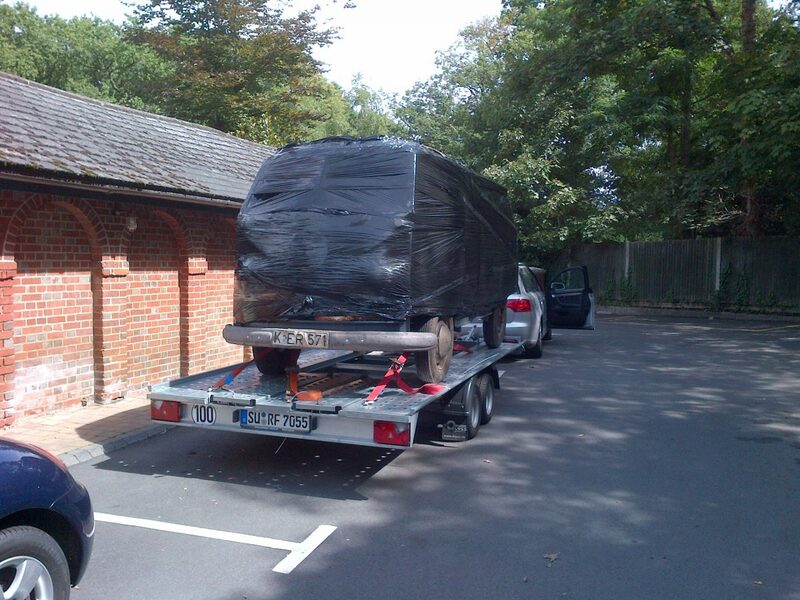 500 kilometer with a trailer, driving on the wrong side…… I could imagine some more pleasant way of adventure. But all this stress was forgotten when we sat down this evening for some bottles of British whine in a fine restaurant. Yes, no kidding, there is British whine today and it´s enjoyable, no doubt. Every day is a school day. Now back at home I just received a mail from Mark with two pictures attached. Please read here his comment and compare the section of the Samba shown in the pictures with the video of the Samba above just a few days before! Aren´t the skills of this man nothing but amazing? I had a little play with the Samba paint btw, admittedly a very odd place to start with such a big resto ahead but at the start or at the end ..it doesn’t really matter 🙂 ( I will cover it with tape to protect it). Wish it was all this good as this was under layers of old paint and also you can see where the trim holes were welded up at some point. I should just add that the very last layer of paint would dissolve in cellular thinners after a lot of rubbing so you are looking at exactly what was under the paint when they first sprayed it and I have caused no damage to what was there. Also to note that deluxes were painted ceiling wax red all the way to the roof gutter and the chestnut brown added after so that’s why you can see the red colour under the brown. On top of that point, 51 deluxes are the exception as they had white roofs and on yours where the rubbers where it is still the original white paint with only the factory primer underneath. The roof looks to have only one paint ever again in white although this has flaked off in 99 % of areas and the original white being a thin coat has mostly burnt off to the primer but it’s still there in places especially round ever window rubber. Then a coat of thick white paint which I think was hand painted. 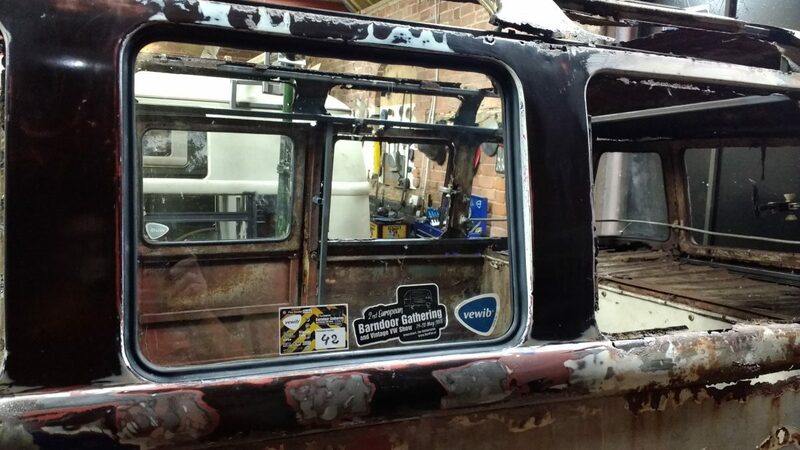 I couldn’t work out at which point the deluxe trim came off in the paint yet..I will try and see when I do a bit more. 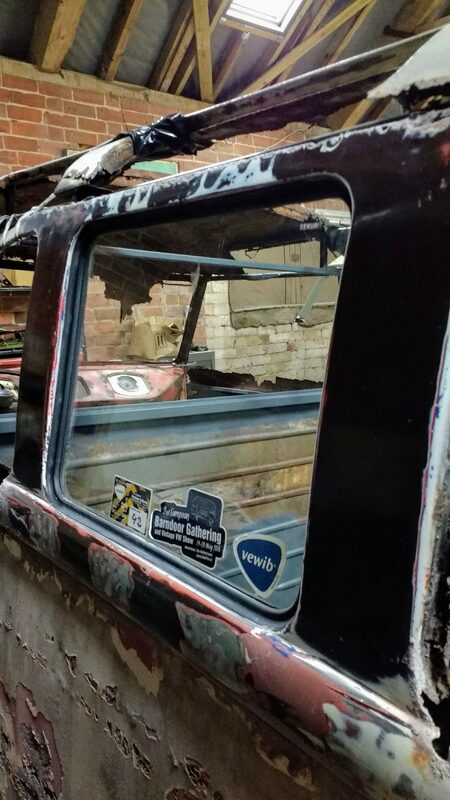 It doesn’t mean anything but it would be nice to work out when the trim was lost during which respray. Sorry to brain dump everything I noticed but these details may be important especially in people recalling the bus in Bonn or may be ID ing the bus in old photos. I strongly believe the Mark was the very best choice for this job I could possibly find, cause he just gets exactly how I want this Samba to be restored. There is even no need to explain to him that we have to save as much of the original substance no matter how much work it takes. This paint job really made my day! I hope you can share my joy. 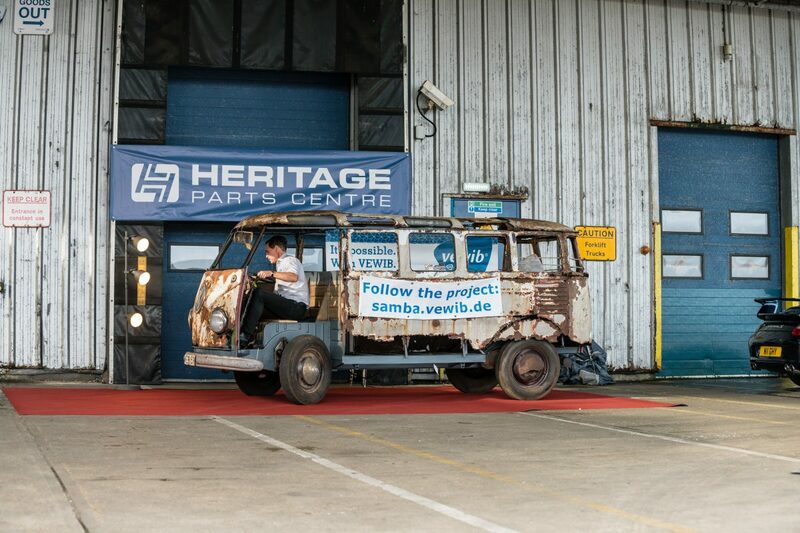 I know the official start of the Samba production was, due to the Volkswagen “Progressive Refinements”-list, June 27th at chassis number 20 – 012 908. But when the IAA 1951 opened its doors at April 19th ´51 there was already a Samba in the booth. I so look forward to these updates!! Thank you for showing the progress, and Marks comments on the paint are fantastic! This is a teaching seminar for me too! If I lived in your country I would be hanging around every day, lol.